The Groundsmaster® 7200 is a zero turn rotary mower rugged enough to be called a Groundsmaster®. Powerful Kubota® 21 kW (28 hp) and 26 kW (35 hp), 3-cylinder, liquid cooled diesel engines get the job done well. Durable heavy duty 7 gauge welded deck construction and the industry’s toughest spindle assembly provide long life. 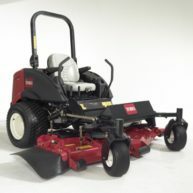 Use the Groundsmaster® 7200 for more than mowing with the added versatility for grooming infields and blowing leaves. The cast iron spindle housings feature a massive 22.9 cm (9 inch) diameter base and eight-bolt mounting pattern that spread impact loads across a broader area of the robust deck shell. Combine that with the high-efficiency, tapered roller bearings that offer greater durability than spindles that use ball bearings. The result is greater stability and strength, providing longer deck and spindle life. The electric-clutch deck engagement is smoother than the manual systems and the new air ride seat suspension glides over the bumps. With the QAS, anyone can switch from one attachment to another in less than a minute, with no tools required! Quickly get your fields back into playing condition. Accessories include: Debris Blower, Finish Grader, Tooth Rake, Drag Mat Carrier System, Cocoa Drag Mat, Steel Drag Mat, and Grooming Broom. The discharge deflector on the 183 cm (72 inch) side discharge and 152 cm (60 inch) side discharge decks is constructed of durable 8 mm (5/16 inch) thick rubber and allows for close trimming without damaging chute or landscape structures. Patent-pending design provides exceptional dispersion. The high-strength 6 mm (one-quarter inch) thick heat-treated alloy steel blades resist flexing and abrasive wear. The result is a crisp cut time after time.